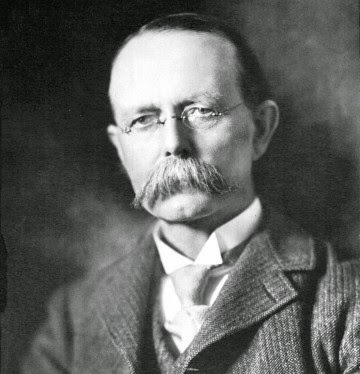 The Irish inventor John Philip Holland built a model submarine in 1878, followed by a number of failed ones. In 1896 he designed the Holland Type VI submarine. The vessel made use of internal combustion engine power on the surface and electric battery power for submerged operation. Launched on 17 May 1897 at Nixon's Crescent Shipyard in Elizabeth, New Jersey. 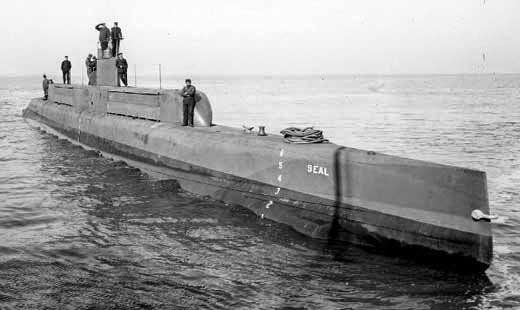 The United States Navy bought Holland VI on 11 April 1900, becoming the U.SNavy's first commissioned submarine and renamed USS Holland. double-hull design, with a pressure hull inside the outer shell. These 200-ton ships had a range of over 100 miles (160 km) underwater. The French submarine Aigrette in 1904 further improved the concept by using a diesel rather than a gasoline engine for surface power. Large numbers of these submarines were built, with 76 completed before 1914. The Royal Navy commissioned five Holland-class submarines from Vickers, Barrow-in-Furness, under licence from the Holland Torpedo Boat Company during the years 1901 to 1903. Construction of the boats took longer than expected, with the first only read for a diving trial at sea on April 6, 1902. Although the design had been purchased entire from the US company, the actual design had been used was an untested improved version of the original Holland design using a new 180 hp petrol engine. These types of submarines were first used during the Russo-Japanese War of 1904-05. Due to the blockade at Port Arthur, the Russians sent their submarine submarines to Vladivostok, where by Jan 1, 1905 there were seven boats, enough to create the world's first "operational submarine fleet". The new submarine fleet sent out its first patrol on Feb 14, usually lasting for about 24 hours. The first confrontation with Japanese warships occurred on Apr 29, 1905 when the Russian submarine Som was fired upon by Japanese torpedo boats, but then withdrew. 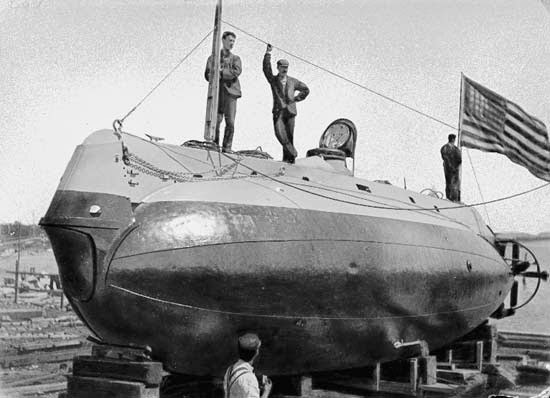 Military submarines first made a significant impact in World War I. Forces such as the U-boats of Germany saw action in the First Battle of the Atlantic, and is often cited among the the reasons for the entry of the United States into the war. At the very outbreak of war Germany had only 20 submarines immediately available for combat, although these included vessels of the diesel-engined U-19 class with the range (5,000 miles) and speed (eight knots) to operate effectively around for entire British coast. By contrast the Royal Navy had a total of 74 submarines, though of mixed effectiveness. In August 1914, a flotilla of ten U-boats sailed from their base in Heligoland to attack Royal navy warships in the North Sea in the first submarine war patrol in history. During World War II, Germany used submarines to devastating effect in the School Battle of the Atlantic, where it attempted to cut Britain's supply routes by sinking more merchant ships than Britain could replace. (Shipping was vital to supply Britain's population with food, industry with ray material, and armed forces with fuel and armaments.) While U-boats destroyed a significant number of ships, the strategy ultimately failed. Although the U-boats had been updated in the interwar years, the major innovation was improved communications, encrypted using the famous Enigma cipher machine. This allowed for mass-attack tactics (Rudeltaktik, commonly known as "wolfpack"), but was also ultimately the U-boats' downfall. By the end of the war, almost 3,000 Allied ships (175 warships, 2,825 merchantmen) were sunk by U-boats.